Hello long lost blog! I’d had this nagging feeling that I hadn’t updated in a while, but I had no idea it had been over a month! I’ve been really busy sewing away on Christmas stuff. Here is my first completed Christmas present, a pair of baby dungarees for our littlest niece. It has been finished for a while but was awaiting buttons. In that time we’ve been lucky enough to have lots of visitors since I finished it, so I’ve been making them all coo over it! The pattern is the whipstitch overmost and it was a delight to sew. I had some issues at first assembling the pattern (it’s a PDF print out), until I realised the pattern had expected me to be using US letter paper (of course!). Once I worked this out, it was pretty plain sailing, but PDF makers: remember not everyone uses the same paper! 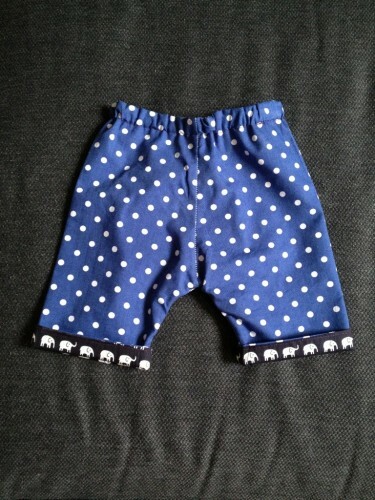 The original pattern didn’t call for poppers, but my niece will be just 9 months old at Christmas and I didn’t think popper-less trousers were fair on her parents, so I used this tutorial to add them. BUT, then I read some comments on this post that suggested poppers aren’t great for crawling babies? I don’t know. I tried! I can always sew the opening closed. I also didn’t use popper tape, I used those ones where you set them with a hammer. That was so much fun. BANG BANG BANG. These buttons! I love these buttons. We’ll be talking about them tomorrow. I’ll be taking two spares with me for Christmas so that I can sew them in the right place if these are too long. My buttonholes weren’t so hot, but ho hum. I should have snipped the threads before taking these pictures. The lining is flannel. The pattern is reversible, but I’m treating it as a lining because it is sooo much softer than the polka dots and I like having the little peeks of it here and there. I wish I’d used the pink fabric for the inside of the pocket, but oh well. Next time! The elasticated waist is my favourite bit. At least, I think it will be my favourite bit once it’s on a cute baby’s bottom. Seriously, this pattern is amazing. It all comes together really well and the instructions are clear. It comes with patterns for three different types of pockets and it’s just so cute! PPS. I also made this baby niece a baby quilt, before she was born. This entry was posted in Uncategorized and tagged sewing for baby, whipstitch overmost on December 12, 2012 by Annabel Vita Admin.